The southwestern United States contains the largest and most technologically advanced military training and testing installations in the world. Many of these of these installations range in size from 1000 to 7000 km2 (386–2700 mi2) and are surrounded by several large metropolitan centers that have greatly expanded since 1970. The establishment of these installations was, in part, a serendipitous timing of the evolving and increasingly mechanized military during early World War II coupled with the availability of an extremely desolate and expansive region of the deserts in the southwestern United States. Prior to WWII, the United States military presence consisted of widely scattered and small forts that existed between 1847 and 1900 for the protection of settlers and supply routes. 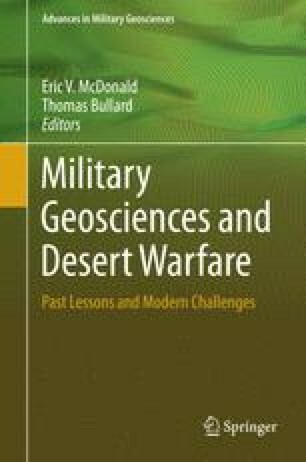 Military interest in the desert radically changed with the entry of the United States into WWII and with the need for troops trained for desert warfare in Northern Africa. General George Patton, clearly seeing the advantages of training in the southwestern deserts, established the Desert Training Center (DTC). The DTC, later the California-Arizona Maneuver Area (CAMA), covered extensive parts of California, Arizona, and Nevada was the first of its kind in that it allowed large-scale maneuvers and training of mobile military operations including armor, mechanized infantry, and supply and logistics. Many additional training facilities were also established during WWII to support the war effort. At the end of WWII, many of the military installations in the regions (including the CAMA) were deactivated. The onset of the Cold War, with combat in Korea and later in Vietnam, several of the former WWII installations were reactivated and expanded in the size and capabilities due to the rapid evolution of military equipment and the increasing need for joint service military training. These large installations, including the Yuma Proving Ground, the National Training Center, Nellis AFB, and the Marine Corps Air Ground Combat Center at Twentynine Palms, all originated during WWII and have evolved into world-class training and testing facilities for world-wide operations. Funding for developing this paper is from Army Research Office grants number DAAD19-03-1-0159 and W911NF-09-1-0256. Any opinions, findings, and conclusions or recommendations expressed in this material are those of the authors do not necessarily reflect the view of the United States Army Research Office. We thank Daniel Gilewitch and Andy Yatsko for thoughtful and thorough reviews of the original version of this manuscript.